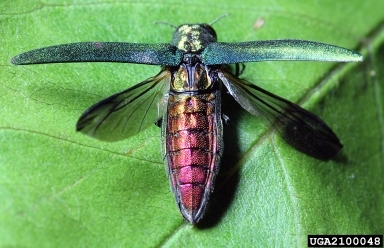 Arkansas joins the growing list of states affected by the Emerald Ash Borer (Agrilus planipennis), or EAB for short, an invasive Asian beetle devastating North American ash trees. Adult EAB. Leah Bauer, USDA Forest Service Northern Research Station, Bugwood.org. The beetle was first discovered on the continent in Michigan in 2002, although it apparently arrived a few years earlier, possibly introduced as larvae in ash wood packing material. 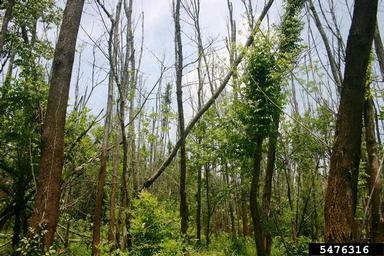 In a little over a decade and a half or so it has spread throughout the Great Lakes region to well into the Northeast and Midwest, killing tens of millions of ash trees, and now, sadly, is advancing into the South. Ash trees dead or dying from EAB infestation in Virginia. Christopher Asaro, Virginia Department of Forestry, Bugwood.org. After discovery of EAB in southeastern Missouri in 2008, the Arkansas State Plant Board and the United States Department of Agriculture began surveying in 2009 for EAB in Arkansas with the use of lure-baited insect traps and by inspecting ash trees for signs of infestation. EAB was detected this summer in traps in southwestern Arkansas and by subsequent field inspections. It is now confirmed from six counties: Clark, Columbia, Dallas, Hot Spring, Nevada, and Ouachita. Given the extent of the infestation, it has likely been in the area for a couple of years. 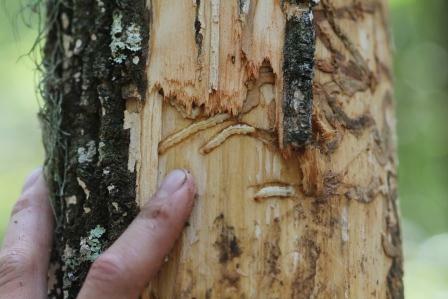 EAB larvae and damage to an ash tree in Ouachita County, AR. Arkansas State Plant Board. 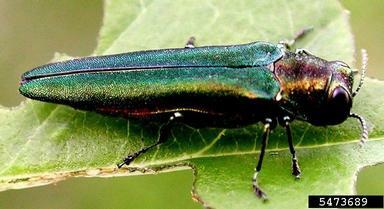 The adults of EAB are small (about 1/3 to 1/2 inch) and metallic green. The upper side of their abdomens (exposed when the wings are extended) is coppery- or purplish-red, a distinctive character of this species. Adult EAB, with distinctive purplish-red upper abdomen exposed. David Cappaert, Michigan State University, Bugwood.org. The adults are present and breeding during the summer, with females depositing their eggs in bark crevices of living ash trees. However, it’s the larvae, linear and whitish with bell-shaped segments, which do the damage, boring extensive, meandering tunnels under the bark while feeding on the vascular tissues, eventually destroying the tree’s vascular transport system, essentially girdling it. 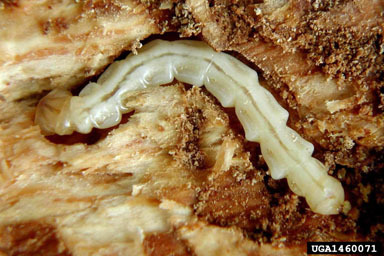 Larva of EAB. Note bell-shaped segments. David Cappaert, Michigan State University, Bugwood.org. Tunnels (galleries) bored through vascular layer of an ash tree by EAB larvae. Troy Kimoto, Canadian Food Inspection Agency, Bugwood.org. Once heavily infested, the tree can no longer transport water or nutrients from the roots to the leaves or sugars produced during photosynthesis in the leaves to the rest of the plant. Branch dieback and sparse foliage are often early symptoms of an infestation, progressing to top-killed trees with prolific branching from the base of the trunks or roots, peeling and splitting of the bark, and eventually death (often within three to five years of initial infestation). Ash tree infested with EAB. Note top-kill and prolific, basal sprouting. Daniel Herms, The Ohio State University, Bugwood.org. After the larvae pupate, the adults emerge in the spring through characteristic D-shaped holes bored through the bark. 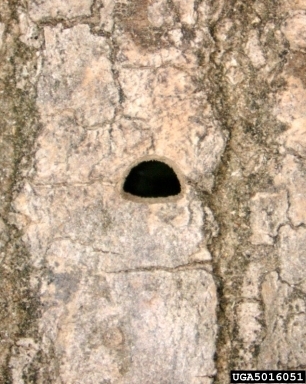 Characteristic D-shaped exit hole through which adult EAB emerges. Pennsylvania Department of Conservation and Natural Resources, Forestry Archive, Bugwood.org. All true ashes (members of the genus Fraxinus) are hosts and are detrimentally affected by the beetle. In Asia, ash tree species which have co-evolved with EAB have developed a chemical resistance to the larvae, greatly inhibiting the number of larvae and the extent of damage they cause. North American ash trees, however, have no natural resistance. 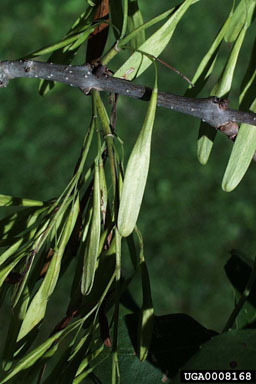 In Arkansas, we have at least five native ash species, two of which occur statewide: green ash (F. pennsylvanica) which is common in bottomlands and on river terraces, and white ash (Fraxinus americana) found in a wide range of habitats (some authorities recognize additional species segregated from white ash, such as F. biltmoreana and F. smallii). Leaf and bark of green ash (Fraxinus pennsylvanica). Karen A. Rawlins, University of Georgia, Bugwood.org. Fruit (samaras) of green ash (Fraxinus pennsylvanica). Paul Wray, Iowa State University, Bugwood.org. The three remaining ashes are each regionally and more ecologically restricted: Carolina ash (F. caroliniana) of swamps and bottomland forests in the West Gulf Coastal Plain, pumpkin ash (F. profunda) of swamps and bottomland forests in the Mississippi Alluvial and eastern West Gulf Coastal Plains, and blue ash (F. quadrangulata) of primarily calcareous uplands in the Ozark Mountains and southwestern Arkansas. Although ash trees make up only about 2.5% of the total forest composition of the state (a slightly higher percentage in the Mississippi Alluvial Plain), their ecological, economic, and aesthetic values are significant. Other native (i.e., fringe-tree [Chionanthus virginicus] and swamp privet [Forestiera acuminata]), and cultivated and introduced (e.g., forsythias [Forsythia spp. ], lilac [Syringa vulgaris], privets [Ligustrum spp.]) members of the olive family (Oleaceae), to which the ashes belong, do not appear to be affected in Arkansas at this point. 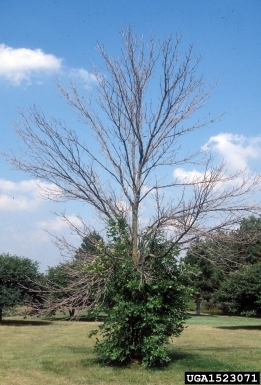 Systemic insecticides (transported within the tree’s vascular system) can be used to protect specimen ash trees, in yards or urban landscapes, for example, but treatment must begin before an infestation is well underway and must be repeated multiple times over numerous years for continued protection (perhaps indefinitely, which could be ultimately rather costly). Once symptoms are noted (especially more than 50% of canopy dieback), it is likely too late for the tree to be saved, as considerable damage to the tree’s vascular system has already occurred. Unfortunately, protection of trees in forested habitats is unfeasible at this time. Although EAB is believed to spread relatively slowly on its own (on the order of a few miles per year), its spread has been greatly accelerated by movement of infested firewood, nursery stock, timber, and other wood products, often resulting in leaps of tens to hundreds of miles. One or more of these was the likely cause (and probable additional dispersal) of the Arkansas infestation. Last month, the Arkansas Sate Plant Board implemented an emergency quarantine to regulate movement of items that pose a significant threat of spreading EAB further. 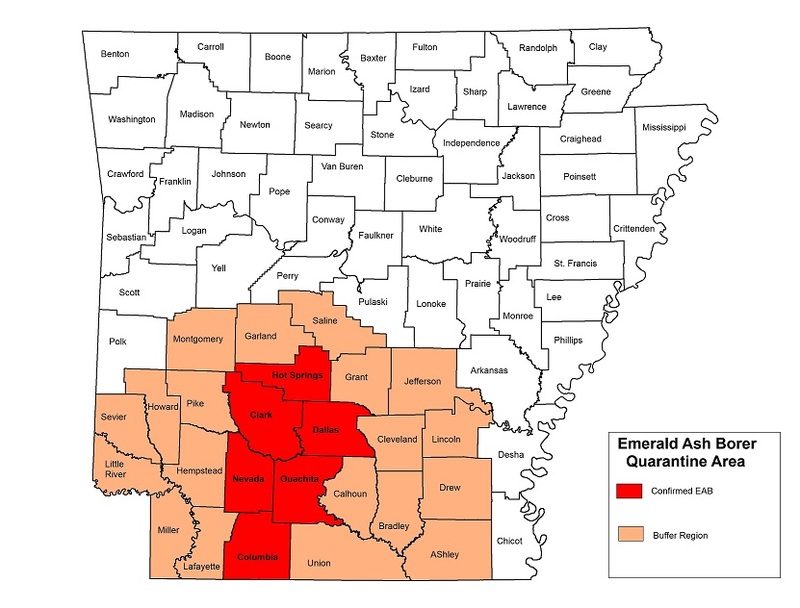 Emergency EAB Quarantine area in Arkansas, including the six infested counties and 19 buffer counties. 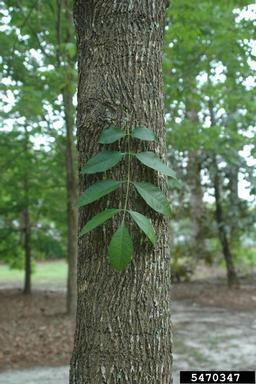 Unless a compliance agreement can be obtained through the Arkansas State Plant Board, items restricted from movement from within to outside the quarantine area include firewood (of all hardwood species, since it is sometimes difficult to distinguish species of cut logs), ash nursery stock, green ash lumber with bark attached, and other ash material (living or dead) greater than one inch in size. Quarantined items can move freely within the quarantined area. This emergency quarantine will be effective for 120 days, during which time the Arkansas State Plant Board will take steps to establish a permanent quarantine rule, a process that will require a public comment period. Of particular concern among the regulated items is firewood, as monitoring of firewood movement is extremely difficult. Campers, hunters, and others recreating in Arkansas are being implored to use wood for campfires collected only from the local area and not to transport firewood more than 25 miles from its origin. If firewood is moved beyond such limits by accident or prior to being aware of the regulations, it should be burned in its entirety as soon as possible and as safely as possible. Such firewood should not be left unburned for future campers or further transported. If you suspect an EAB infestation or note ash trees exhibiting unexplained damage or mortality, especially outside of the six known infested counties, contact the Arkansas State Plant Board (501-225-1598), your local Cooperative Extension Office, or your local forester. And, if you’ve ever had any tree-hugging inclinations, perhaps you might want to hug your favorite ash tree(s) while you still can. You will not be judged…there’s no shame. I’ve already a hugged a few. Article by ANPS member and Arkansas Natural Heritage Commission botanist Brent Baker. 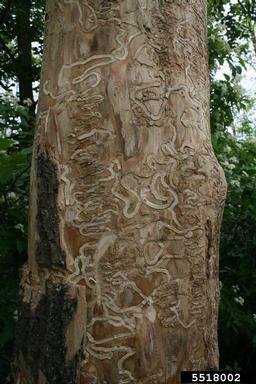 This entry was posted in Trees and tagged Agrilus planipennis, Ash Trees, EAB, Emerald Ash Borer. Bookmark the permalink.